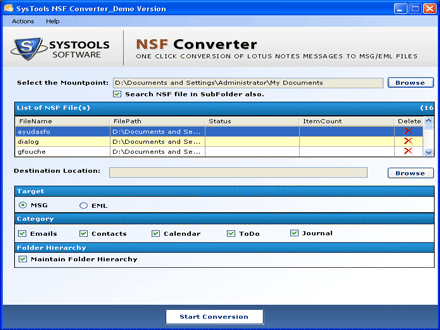 Lotus Notes to Windows Live Mail converter can be considered as a direct medium to transfer NSF emails to Windows Live mail. One can easily migrate emails from Lotus Notes to WLM with help of this utility. Convert all items of IBM Notes i.e., Emails, contacts, calendar, etc. The process to convert NSF emails into Windows Live Mail involves two major steps, which enable one to perform an easy email migration. Windows Live Mail is free desktop-based email application, which was developed by Microsoft and is available for downloading through Windows Essentials suite. It is considered as an update in Windows Mail program on Vista Operating system. This application is operated on Windows 7, Windows Server 2008 R2, Windows 8, and Windows 10. The WLM program supports email ids, which are created in web-based clients. It archives its data in EML format and is also capable of supporting or opening MSG, DBX, EDB, etc. The software of this program can be easily downloaded from its official website and one can experience an ease in managing emails. Lotus Notes is a purchased desktop-based email application, which was developed by IBM. It saves its contacts in a different file i.e., names.nsf and database is addressed as nameofuser.nsf. Notes NSF is rendering its end users with variety of features like Contact Management, To-do list, calendars, emails, etc. In comparison to other email applications, this program provided a high security to save data forging. The procedure provided here is safe and secure for Lotus Notes to Windows Live mail conversion. One need not have any stress over any revealing of database while performing the conversion. Moreover, not even a single data modification takes place when software is moving data from NSF to Windows Live Mail. After getting whole satisfaction from the demo version of the software, users can purchase the software to for experiencing an unlimited conversion.